Nowadays many people lead busy lives. We just have many things to take care of, for example, our business, our family, school, our job, and many other things. When the time comes to move our home or business, we want everything to be done quickly and hassle-free. It is especially true when it comes to moving a vehicle. When you have no time to wait and need your a vehicle delivery as soon as possible, expedited auto shipping is the ideal choice for you, as it ensures the fastest pick-up availability. 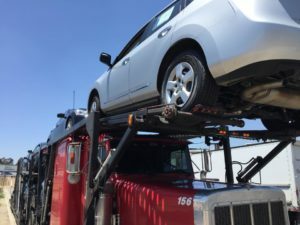 Philadelphia Car Transport provides fast and convenient expedited car shipping services all over the United States. Expedited auto shipping is the quickest way to move a vehicle from point A to point B, which means you will get the fastest pick-up. Typically you need to book car transport a week or two prior to the desired pick-up date. But, with express car transport, we will pick up your vehicle in a day or two at the most. What we ask our clients to understand is that a quicker pick-up is the only way to make shipping a vehicle faster. Car carriers must follow safety regulations, such as speed limits and a limited number of miles they can travel a day. Therefore, it’s physically not possible to make an auto hauler deliver faster. Only the pick-up date can vary. Expedited auto transport is more expensive than regular car shipping. But, when time costs more than money, this service is a very good option to consider. Contact us for free Philadelphia auto shipping quotes. You can request them here on our website or give us a call at our office during normal business hours.